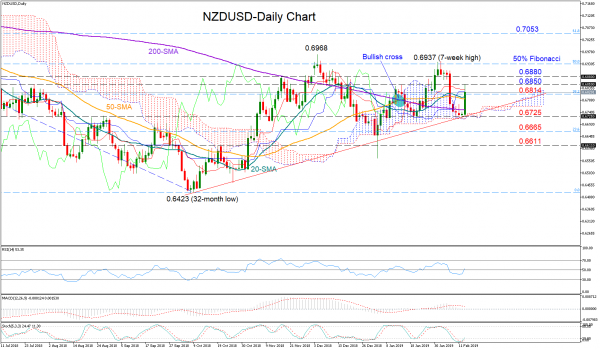 NZDUSD jumped with full force early on Wednesday after finding support at the top of the Ichimoku cloud as stochastics entered oversold territory below 20. The RSI is positively sloped slightly above its 50 neutral mark, a sign that positive momentum may stay in place in the short term. Yet, with the MACD weakening below its red signal line and the red Tenkan-sen line losing strength, some caution may still be needed. An extension higher could see resistance coming within the 0.6850-0.6880 area, where the rally stopped today. Moving further up, the previous high of 0.6937 and the December peak of 0.6968 could halt upside movements. Should the bulls take out these tops, and more importantly, close above the 50% Fibonacci of the downleg from 0.7436 to 0.6423, additional gains could emerge until the 61.8% Fibonacci of 0.7053. On the flipside, a reversal to the downside may see immediate support arising near the 38.2% Fibonacci of 0.6814. Lower, it would be interesting to see whether the bears are strong enough to snap the 0.6725 level and therefore the uptrend line drawn from the 0.6423 low. If that’s the case the market could dip into further losses to test the 23.6% Fibonacci of 0.6665 and the previous resistance area around 0.6611. In the medium-term picture, NZDUSD maintains the sideways move started early in November. The bullish cross between the 50- and the 200-day MAs has somewhat increased hopes for a bull market in the medium-term, but with the 50-day MA holding flat, signals are unconvincing.